RFMF Major Lepani Damuni (left), Minister for Fisheries Semi Koroilavesau (right), Assistant Minister for Rural and Maritime development and National Disaster Management Joeli Cawaki (second from right) upon returning from the aerial survey of Kadavu on April 13, 2018. Photo: Ronald Kumar. 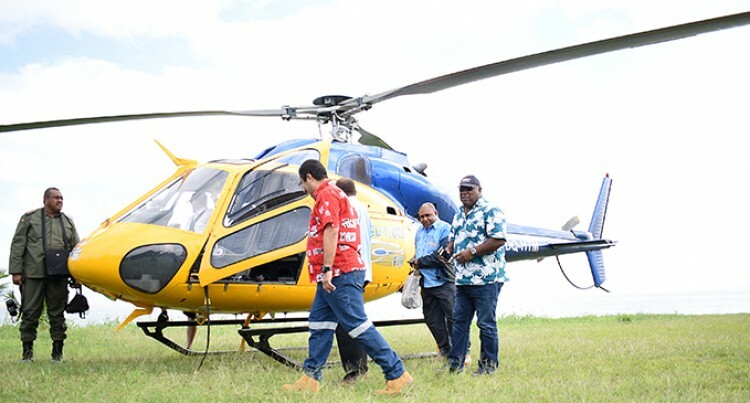 A Government delegation conducted a one-day aerial survey of Kadavu by helicopter yesterday to assess damage caused by Category 3 Tropical Cyclone Keni earlier this week. The delegation consisted of the Minister for Fisheries Semi Koroilavesau, Assistant Minister for Rural and Maritime Development and National Disaster Management Joeli Cawaki, Commissioner Eastern Luke Moroivalu and Republic of Fiji Military Forces Major Lepani Damuni. Mr Moroivalu said Kadavu appeared to be the worst hit, with homes destroyed and trees uprooted. He said they did not have details as to how many people were affected by TC Keni. “From what we saw, most of the houses were partly damaged or destroyed and it is unfortunate that communication to Kadavu is down,” Mr Moroivalu said. “We went to assess the damage then we are going to advise the National Disaster Management Office (NDMO). A multi-sectoral team will then be sent to further assess damage. “We have received initial reports from Government workers and various Turaga-ni-Koro indicating that housing and agriculture were the sectors that sustained the most damage. “We will deploy multi-sectoral assessment teams with immediate relief supplies to verify reports on the ground on Sunday. “Currently, Non-Governmental Organisations (NGO), civil societies and embassies are facilitating an aerial survey on our behalf and the data received will allow us to make concrete plans of response,” he said. With regard to the agricultural sector, Mr Moroivalu said for most parts of Kadavu there had been damage to vegetation and root crops. “For farms, most farms are affected. There have been damage to vegetation and root crops on Kadavu. Initial communications received indicate that there has been little or no damage to crops,” he said. Meanwhile, the French Navy (Marine Nationale) assisted with an aerial survey on behalf of the National Disaster Management Office, yesterday. In a tweet, France’s Ambassador to Fiji, Sujiro Seam, said: “Meeting from the crew of the Gardian to retrieve photo during a low-altitude aerial surveillance of assist the National Disaster Management Office in the assessment after TC Keni,” he said. TC Keni did not make landfall, but at its height was 60 miles east southeast of Kadavu.